Kelsey Julian (Kennewick HS) is a Senior with Eastern Washington University. Kelsey has been repeatedly named to the Big Sky All Academic Team while she's been racking up kills and blocks on the court. Kelsey is pursuing Physical Therapy while at Eastern. (Fun Fact: Kelsey rules at the Discus too.) We love seeing Kelsey come back to our practices. We would love to see both these young women back and coaching with Columbia in the future! To find our complete list of Alumni Players who played in college, click our Alumni Page. WSU, and has become one of the best blockers in WSU history. (Fun fact: younger sister Alisha also played for Columbia.) Chelsey is studying Kinesiology and movement studies at WSU. Fellow Senior Jaicee Harris has become one of the most decorated attackers in WSU history. (Fun fact: can you guess her connection the Cleveland Cavaliers?) Jaicee was a rare two-time all-state player in High School, and is studying criminal justice. Check out our Alumni Page for more links to our former players now studying and playing in college. We miss you ladies, come see us at practice! 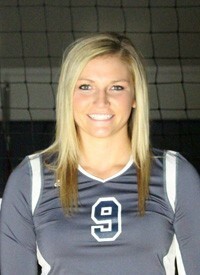 Page Woodward (Royal HS) just finished her senior season with the University of Great Falls (in Montana.} Page is majoring in Education, and will make a great teacher and coach! Briawna Mueller (Hermiston HS) was a star MH at Gonzaga University, but now she's a graduate student at Webber International University in Florida. 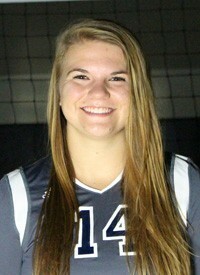 Briawna has found a second volleyball career on the beach playing for Webber! (See if you can figure out which current Columbia player is related to Briawna.) We are eagerly waiting for Briawna to come home and coach for Columbia! You can find all our former players who went on to play in college on our Alumni Page. We're catching up on some of our former Columbia JVBC players currently playing volleyball in college. Kendra De Hoog (Junior, Ephrata HS) and Amanda Miller (Freshman, Kamiakin HS) both went on to play at Eastern Oregon University together this past fall. Kendra is studying Excercise Science and Nursing. Amanda is studying Teaching. We bet they'll both make great coaches some day too! Note: Kendra and Amanda are currently playing in the NAIA National Tournament! Watch for more updates on our former players, and watch for them to show up at our practice!